The climate and variable weather in the eastern United States pose challenges for broccoli growers. This cool season crop suffers structural abnormalities under the hot and humid conditions that can characterize eastern summers (see the Flower Development page for an explanation), and the variable weather can make yield, quality, and time to maturity more difficult to predict. Most broccoli consumed in the U.S. is harvested from hybrid cultivars specifically developed for California production environments. The creation of new hybrid broccoli varieties targeted to eastern growing conditions is a critical goal of this project. We have assembled substantial resources to accomplish this objective, including all three public broccoli breeding programs and three private seed companies with large U.S. broccoli programs. Mark Farnham leads the broccoli program at the USDA Vegetable Research Laboratory in Charleston, S.C. He has developed broccoli lines that are adapted to the warm summer conditions of the southeastern United States. Farnham has also developed lines with disease resistance and enhanced nutritional content. Phillip Griffiths, of the Vegetable Breeding Program at Cornell Agritech in Geneva, NY, works with broccoli lines from Cornell’s collection and has access to the international Brassica collection of Horticultural Research International in Wellesbourne, UK. His selections are being used to develop hybrid combinations for adaptation to the hottest conditions that occur in the Northeast, and with improved disease resistance. James Myers of Oregon State University, while based on the West Coast, has developed broccoli lines with a number of useful features, including elongated heads for ease of harvest, tolerance to heat and other stresses (particularly in those found in organic systems), dark green color, and high phytonutrient content. Our three original commercial seed company collaborators – Bejo, Syngenta, and Monsanto – have used their own broccoli germplasm and considerable know-how to specifically develop new hybrids for the eastern U.S. Thus, we have access to germplasm and expertise that will produce the new varieties. We also established a regional testing system to provide standardized evaluations of new hybrids across a range of eastern environments. Our breeding progress has been excellent. When we began in 2011, the best hybrids from previous breeding efforts were slightly better than standard varieties on the market. By 2014, the best new hybrids were nearly full commercial quality in our testing environments. The graphs below illustrate this improvement. Four key traits that contribute to the quality of crown-cut broccoli were scored across 10 Phase I trial environments. (See box at the bottom of this page for specific trait descriptions.) A score of 3.0 is the minimum commercial quality. A score of 4.0 is full commercial quality. 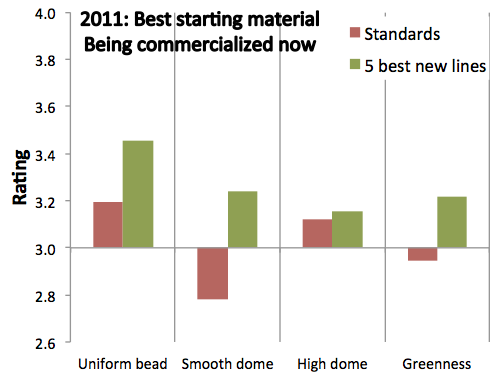 The top five new hybrids (green bars) that scored best for subjective overall quality are compared with the commercial standards in 2011 (top) and 2014 (bottom). The same six standard varieties were used as checks each year, while the new lines changed from year to year as breeding programs contributed new material. The lower scores that standards received in 2014 is indicative of more stressful growing conditions that year – which makes the higher ratings for new hybrids in 2014 all the more impressive. First, we are working to commercialize eastern-adapted hybrids developed through 2015. Some of the top hybrids from 2011 and 2012 trials (BC1691 and Lieutenant from Seminis, Burney from Bejo, and DuraPak16 from Syngenta) are already on the market. These varieties were already under development at the start of this project but were released in the East due in part to strong performance in our trials. 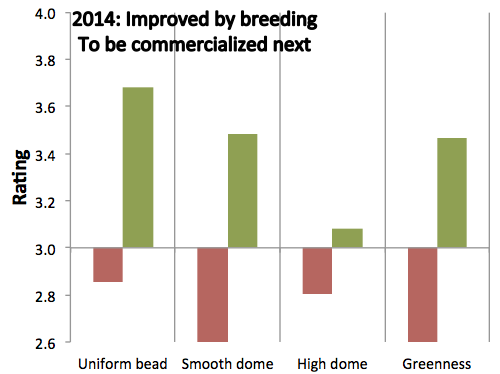 Over the next few years, the best hybrids developed through 2015 will become available to eastern growers. Seed companies will market and release their own new hybrids, and they can choose to license and sell the top public hybrids, as well. We anticipate that, by 2021, six new, eastern-adapted hybrids will be on the market for eastern growers. Secondly, we are strengthening public broccoli programs. New production challenges, changes in buyer and consumer preferences, and other developments will warrant further improvements to broccoli through breeding. Even as better hybrids for eastern growers advance towards commercial release, our public broccoli programs are bringing in new sources of genetic variation and adopting genomic techniques that will broaden their capabilities and increase the efficiency of future breeding efforts. They will draw on these resources as they continue to create and to test new hybrids for eastern production, targeting disease resistance, flavor, and other desirable characteristics. Key traits that contribute to the quality of broccoli crowns. Uniform bead refers to the appearance of the tiny flower buds that cover the upper surface of the broccoli crown. Ideally, these should all be about the same size; however, stressful growing conditions can result in noticeable variation in the size of these buds on individual crowns, which can lead buyers to reject the crop. Smooth Dome takes a step back from focusing on the bead and instead looks at the whole surface of the crown. An even surface achieves the highest rating; minor undulations delineating the underlying florets is acceptable, but an uneven, lumpy head is not. High Dome means that, at maturity, the shape of the broccoli crown is convex (rounded like a scoop of ice cream) as opposed to flattened or even slightly concave. Crowns that are too flat do not shed easily shed water, which can increase the incidence of broccoli disorders such as brown bead. Greenness is simply the color of the broccoli crown. The preferred hues are green to dark green to bluish green; unhealthy-looking yellowish, lime, or olive green color is unacceptable.